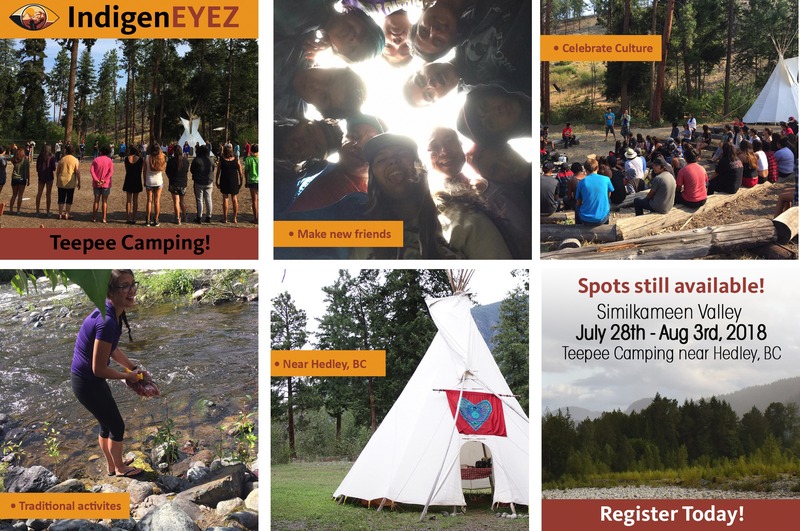 July 17, 2018—Cawston, BC: We’re counting down the days until our Youth Camp in the Similkameen Valley near Hedley, BC from July 28th to August 3rd. Our youth camps provide a learning experience that brings creativity and the arts together with culture and on-the-land activities. Participants leave with new friends and mentors who can support them in their formative years. Our funders are paying the tuition. You just need to register. Participants say that the skills they learn with us give them strength and courage for tackling the challenges that Indigenous people face today. What will this outdoor camp be like? Check out our new video featuring facilitator Timothy Manuel speaking to traditional land-based activities, learning with mentors, and the benefits of being present with youth. Spend a week in a community where everyone supports you to grow in ways you never thought possible. Learn amazing things about yourself and others. Develop confidence in your own voice and abilities. Spend time on the land. Explore your cultural roots. Find the motivation to follow your dreams. Spots still available – register today!